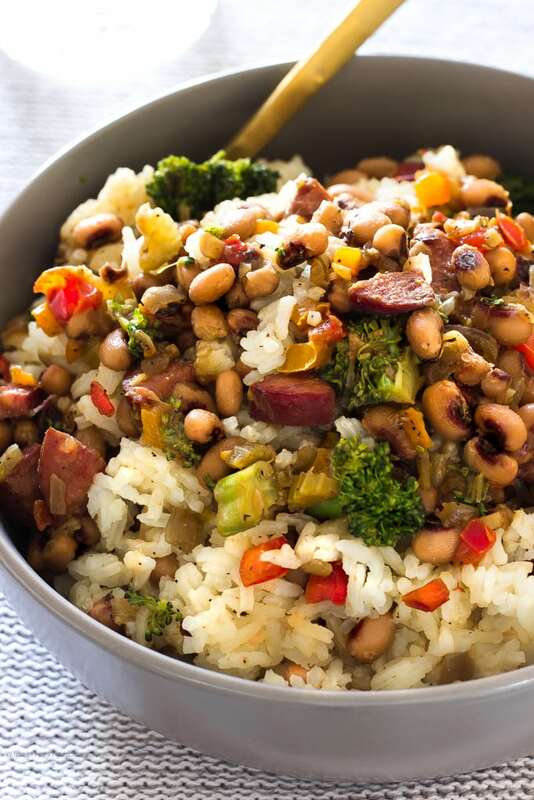 Traditional Hoppin John is thought to bring luck and prosperity. It’s a staple New Year’s day dinner in the south, especially in South Carolina. Classic Hoppin John is made with ham hocks or bacon and cooked in one pot. 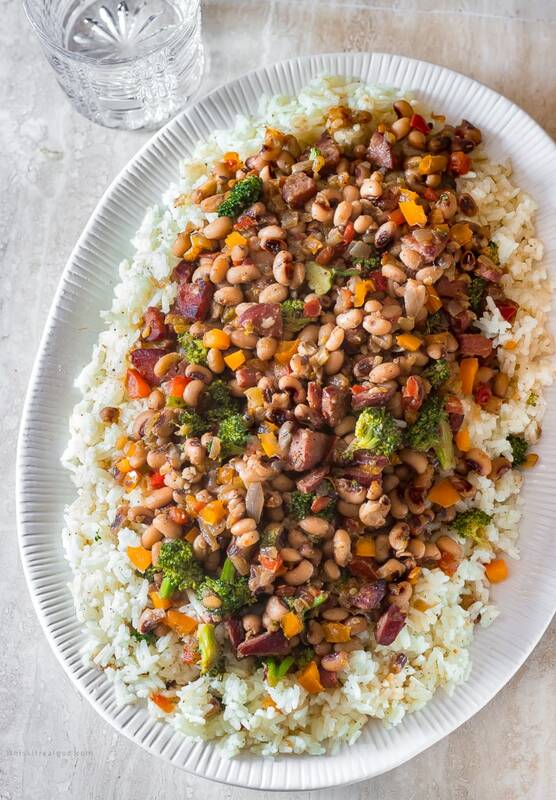 My quick version uses, smoked fast cook sausages and more vegetables like healthy broccoli, frozen black-eyed peas and for kick, a couple pinches of crushed red peppers. This is an easy hearty dish that’s ready in 30 minutes or less. I hope you had a safe and Merry Christmas! Of all the days this year, I ended up spending Christmas sick with a cold and flu. My teen was sick last week so I guess he gave me his germs. I’m still sick but I feel a somewhat better. I hope to be back to normal in a couple days. Please read the entire post for recipe ideas and tips. 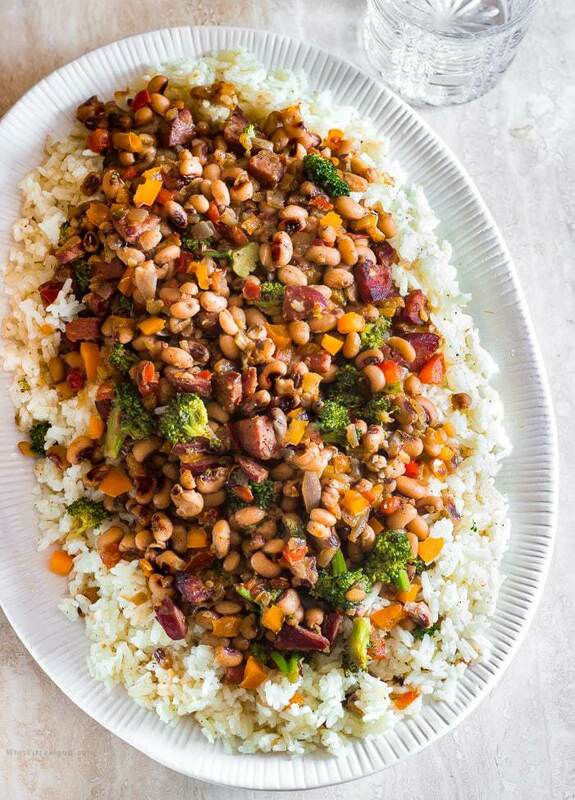 Inexpensive, delicious, hearty, filling dish Hoppin’ John recipe is found in most southern states, but it is mainly associated with the Carolinas, Gullah or Low Country. Black-eyed peas, were introduced to America via the transatlantic slave trade. Historically this dish is all about using what you have on hand. African slaves made due with what they were given. During slavery, they were only given scraps from pigs etc, so I doubt that they were given bacon. This could be the reason why a lot of people prefer to use ham hocks in their pea/bean dishes. My family is also from South Carolina, so it’s only right to post this delicious super simple filling quick recipe. I’ve modernized this Hoppin John by adding not so traditional vegetables and different color bell peppers for color. Hamhocks take a while to cook so I swapped them out for quick cooking kielbasa smoky sausages. You only need 2 and a half cups of black-eyed peas. For the rice, use 2 cups raw rice. I love peas. I grew up eating all kinds of them. You name it, I probably ate it. When I was a kid my grandmother ALWAYS had a bowl of soaking peas/beans. For this recipe, feel free to use dried cooked peas or frozen peas if you like. If you want to use canned black-eyed peas, cook them just until warmed through. Add the canned beans about 8 minutes before the rice is done. If you don’t have black-eyed peas you could use any kind of beans/peas you have. Hoppin John is traditionally served with collard greens but I also love to eat this with buttered cornbread. Off subject but I think it may help someone. 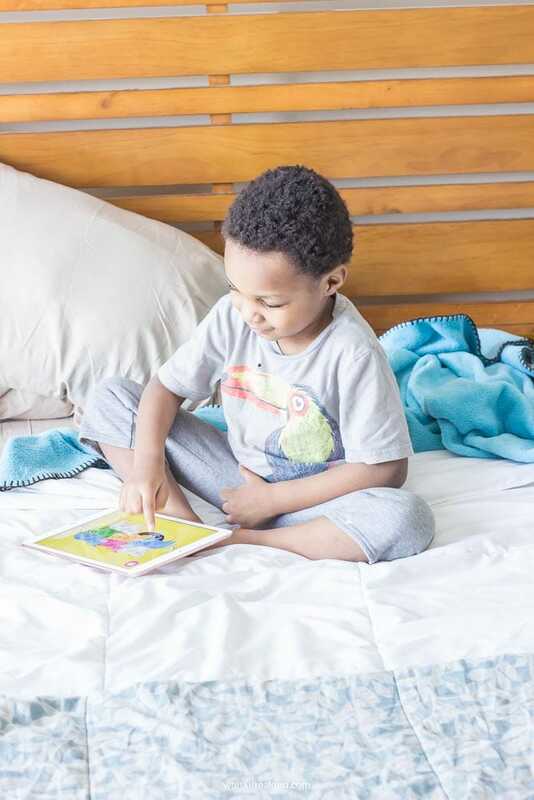 Did I tell you that my 3-year-old actually ate grapes and blueberries recently? I’m still in shock. If you read my blog then you know that Josiah is a super picky eater. He doesn’t like A LOT of foods. This kid did not like grapes or blueberries or any other fruit besides bananas. Each time I’d try to give him fruit other than bananas he’d frown and push it away. How did I get him to eat the grapes and blueberries? I read an article online about how to get your toddler to eat more vegetables. The writer mentioned that it’s a good idea to leave vegetables out where kids can reach and snack on them. I didn’t try it with vegetables yet, but as you already know, the technique worked with the blueberries and grapes. I’ll need to search for the article again and bookmark the site. I can’t wait to try vegetables. Okay, I posted some tips/ideas to make this recipe your own in the recipe notes and below. Like I said initially, this recipe is all about what you have on hand. Use your favorite veggies and meats or whatever beans you currently have. Make it your own. You can saute the vegetables and sausages then serve over hot rice or cook the vegetables and beef with the rice. Add your choice of meat: ham hocks, bacon bits, smoked turkey, lamb, diced ham. I’ve made this with oxtails, roast beef and of course sausage so far. If you are going to use ham hocks and canned beans make sure you add the beans right before the rice is done. 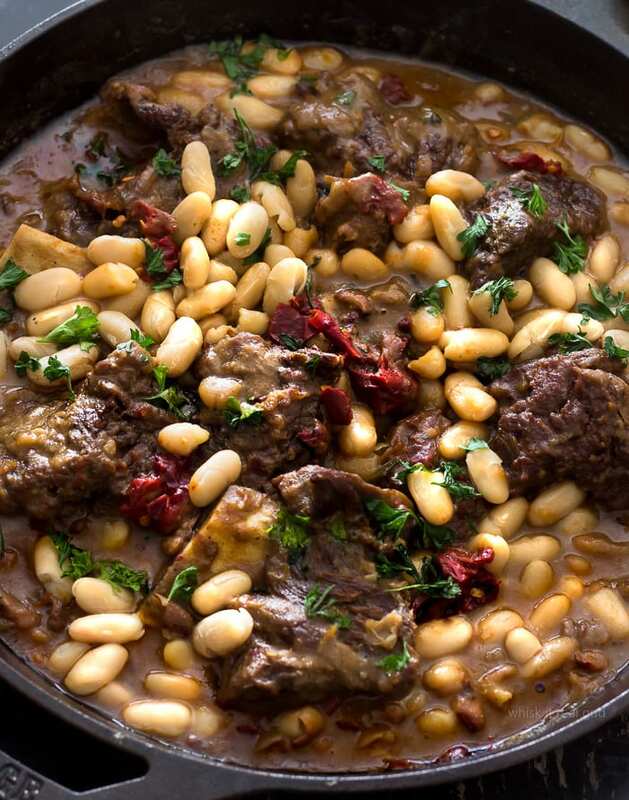 Canned beans should only cook until warmed through.If they are cooked for too long they will turn mushy. Frozen beans will work better if you want to cook them with the rice and the other vegetables. You could also use diced ham instead of ham hocks with the canned peas. If you don’t have black-eyed peas/beans use whatever beans you have. For veggies, use your choice of vegetables like spinach, jalapenos for a little kick, kale, tomatoes. For a colorful dish, use a mixture of bell peppers and sweet mini peppers. I used red and orange bell peppers. Traditionally this dish is served with collard greens. I love to serve it with cornbread as well. 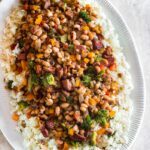 I hope you can try this Hoppin John recipe this New Year! 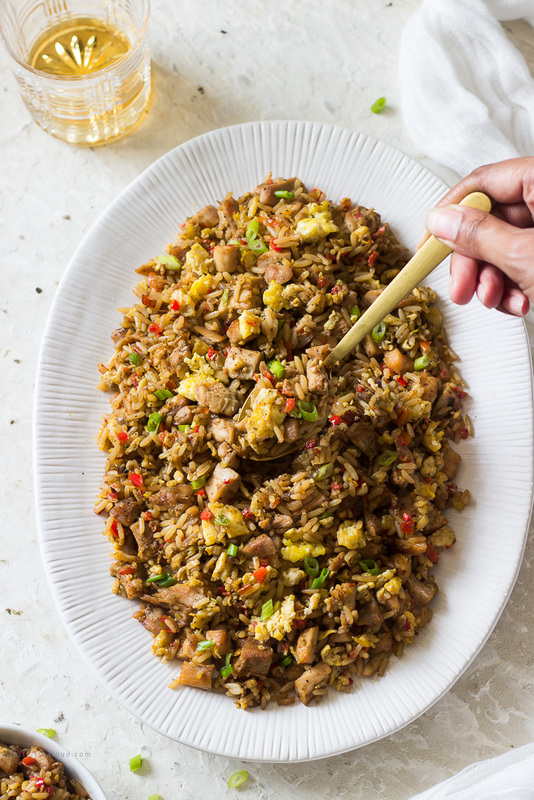 Traditional Hoppin John is thought to bring luck and prosperity. It’s a staple New Year’s day dinner in the south, especially in South Carolina. Classic Hoppin John is made with ham hocks or bacon and cooked in one pot. My quick version uses, smoked sausages and more vegetables like healthy broccoli, frozen black-eyed peas and for kick, a couple pinches of crushed red peppers. This is an easy hearty dish that’s ready in 30 minutes or less. Add vegetable oil to a large frying pan over medium-high heat . Once the oil is hot cook the sausage over medium-high heat until browned. Saute vegetables (except for the broccoli and garlic) in a large frying pan over medium heat until softened and translucent about 5-8 minutes. Add the garlic on top of the vegetables. Cook garlic until fragrant. In a medium pot over high heat add the rice, frozen peas and the sauteed vegetables and beef (you can add the broccoli at this point too if you like). Stir constantly for about a minute then add 3 cups of chicken broth and bring to a simmer. Simmer until the water is reduced and rice is done. If you want more bite to the broccoli, add it 8 minutes before the rice is done. Serve immediately. This dish is usually served with collard greens. You can either cook the vegetables/beef separately and then serve over hot rice or cook them together with the rice. Add your choice of meat: ham hocks, bacon bits, smoked turkey, lamb, diced ham. I've made this with oxtails, roast beef and of course sausage so far. If you are going to use ham hocks and canned beans make sure you add the beans right before the rice is done. Canned beans should only cook until warmed through. If you want to make this quick then use bacon bits, diced ham or smoked sausages. If the black-eyed peas cook too long they may become mushy. Frozen beans will work better if you want to cook them with the rice and the other vegetables. You could also use diced ham instead of ham hocks with the canned peas. If you don't have black-eyed peas/beans use whatever beans you have. For veggies, use your choice of vegetables like spinach, jalapenos for a little kick, kale, tomatoes. For a colorful dish, use a mixture of peppers. I used red and orange peppers. You know, I’ve lived in the South now for almost 10 years and I have never had these. I know a lot of people still make them… I guess I need to be invited over there. Or I’ll make these instead! Really? Wow! You have a whole year to make it lol. Thank you Nicole! Just in time for NYE! I’ve never made Hoppin John at home but I’ve ordered it at restaurants a few times and loved it! Omg looks sooo good! I am starving looking at your pictures. By the way, I love how you have a “skip to recipe” button! I love the name of this dish and learning about the history of it. I have a picky eater too, but she just ate some broccoli flowers and I literally danced around the kitchen when she did that. I showed her a video of a kid eating veggies so she copied her. I tell ya. Peer pressure works sometimes! Lentils and legumes are such a huge part of my diet since becoming insulin resistant, I’m thankful for this recipe and all the alternatives you suggested! I don’t eat pork either which is why I use smoked sausages. Haha. Yes, cornbread, collards, and hot sauce, Yum!. Don’t make me hungry now! Thank you Catherine! Love this healthier version of an old classic! Please do try it. You’ll be surprised how easy and tasty it is. Thank you Elizabeth. I have NEVER tried this, but sure do love the sounds of it. Perfect comfort food for the very cold weather we are having right now. I think I will have to pick up some ingredients while I grocery shop to give this a try. Hopefully, they have some in stock! My sister went to three stores today and they didn’t have any left. That’s just nuts! Thank you Gloria. Thank goodness for the web! Thank you Alecia! My MIL makes Hoppin John every year for New Years! I’d love to have a recipe to trade with her! This sounds easy and tasty! Sarah, I think a lot of people are cooking them soon because my sis told me she went to three grocery stores today and they all ran out of black-eyed peas! LOL…Unbelievable lol. Glad I keep a decent stock of black-eyed peas. Thank you! I can’t believe I have never had Hoppin John. Everything about your recipe sounds awesome and perfect comfort food. A lot of people have not had it or heard of it. It’s a great recipe. Try it one day! Thank you Jere!